Martha Morgan Hill was born in Blacksburg, Virginia and now lives in Cincinnati, Ohio with her mother (June), her stepfather (Jerry), her brother (Jake), and her golden retriever (Di). Her father (Tim) and her stepmother (Sharon) live in Lexington, Kentucky - close enough that she is able to see them frequently. In the past year, she has really enjoyed being home and being able to spend time with friends and family. Since her two wonderful years at Ohio Wesleyan University in Delaware, Ohio, she has been on an academic hiatus of sorts. This past year, she was an acting intern at the Ensemble Theatre of Cincinnati. She put in long hours every week building and striking sets, rehearsing, running lights, and working at the box office. Although she saw Kevin very little, it was a learning experience that she is sure to take into life outside the theatre. Martha is currently enrolled at the College of Mount Saint Joseph, where she is studying art education. She plans to teach at the high school level when she gets her degree and teaching certificate in 2004. Shortly thereafter, she plans to begin her graduate studies. Kevin Michael Carroll was born in Athens, Ohio. His parents (Chuck and Bonnie) still live in the house in Stewart where he grew up. He has two younger biological siblings, Erin and Keith, and three adopted siblings, Solanna, Chris, and Nick. Solanna is married to Ryan Harris and they have two daughters, Celina and Brittne. Erin married Mike Lucas on June 15, 2002 and will start her graduate studies at Ohio University in the fall. Kevin graduated from the University of Cincinnati with a Bachelor of Science in Computer Engineering in June 2000. He immediately took a job with Proctor & Gamble, where he works in IT (R&D Global Application Support). Kevin went back to the University of Cincinnati in the Fall of 2001 to earn an MBA in the evening program. He will graduate in 2004. In addition to work and classes, Kevin keeps busy by playing volleyball in the winter and softball in the summer, both of which are P&G leagues. He even coordinates the 12-team coed softball league. He and his two Siberian Huskies (Chief & Kolder) live in their new house in Springdale - on the north side of Cincinnati. 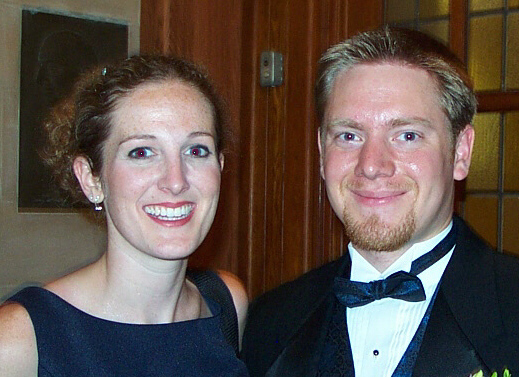 Kevin and Martha met through his sister Erin. Martha and Erin were both involved in the West Ohio Conference Council on Youth Ministries of the United Methodist Church when they were in High School. They ran against each other for President of the "CCYM" (Erin won). In Martha’s senior year/Erin's Junior year, they went on a Conference Youth trip to New York City together and really bonded on the long bus rides. On the way home, Erin told Martha that her brother was at UC- just around the corner from where Martha lives - and that he was looking for a home church and might like to get to know some people in the area. So Erin gave him Martha’s number. Kevin called and called for a couple of weeks, pestering Martha to go out with him until she finally gave in. She invited him to dinner before her talent show at the high school. Although neither was very impressed by that first blind date, they stayed in touch - hanging out more and more and eventually becoming great friends. Even their friends became great friends - two of whom just got married (Kelly and Jason). Kevin and Martha dated briefly before Martha left to work in Colorado for a summer, but a long-distance relationship just didn’t work for them at the time. Although they continued as friends - best friends, it wasn't until Christmas of 2000 that they got back together for good. As they say, the rest is history. In the summer of 2001, Kevin and Martha flew out to Colorado for vacation (Photo Album). After spending a day in Denver with Martha’s sister Lindsay, they joined up with Kevin’s mom, dad, and sister Erin in Colorado Springs. It was there that Kevin began to search for a temporary ring, since the ring he designed was not finished in time for the trip. After a scenic hike at Seven Falls, Kevin found the temp. In the Seven Falls gift shop, he was able to manage some alone time - enough to locate a small but suitable ring. From Garden of the Gods to the Royal Gorge to Pike’s Peak, Kevin kept the ring in pocket, waiting for the right moment. Or was he procrastinating? Claiming that Martha preferred no audience for this sort of thing, he even passed up a chance to propose at a classy Colorado Springs restaurant, where the two of them were enjoying a quiet meal in celebration of their six-month anniversary. And so they continued on to Estes Park. Upon arrival in Estes Park, Kevin and Martha went straight to the ranger station to reserve campsites on the popular Thunder Lake and Bridal Veil Falls trails (and still Martha didn’t have a clue). The following day, Kevin, Martha, and Erin packed up their gear and headed for the foot of the 8.7-mile Thunder Lake trail. Although they passed a beautiful waterfall, Kevin again pulled the crowd excuse to himself, hoping there would be fewer people in the morning. Unfortunately, the morning didn’t work out either. Kevin apparently didn’t drink enough water on the uphill hike and he succumbed to what was likely a combination of dehydration and altitude sickness, though he made it to the campsite. After setting up camp, Erin and Martha left Kevin to nap and went to check out the beautiful Thunder Lake. When they returned, they fed Kevin just enough food and water that he left a present for the bears - right in front of the tent (much to Erin’s dismay). Apparently, he just couldn’t keep it down. Although he felt much better after a long night’s sleep, there was no proposal on the trail home. Besides, what better place to propose than Bridal Veil Falls, right? Unfortunately, after the long hike, Martha and especially Kevin didn’t feel much like making another overnight trip. Doh! Time for a new idea. A couple day-hikes later, Kevin still had not worked up the nerve to pop the question. 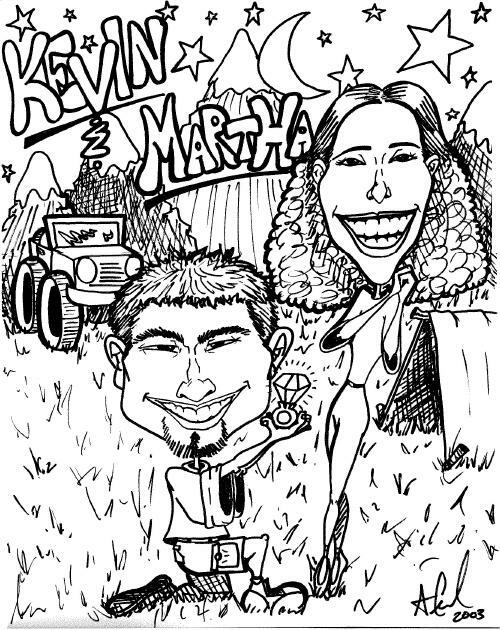 On their last night in Estes Park (June 30, 2001), Kevin and Martha drove their rental truck into Rocky Mountain National Park. Erin had smartly refused Martha’s repetitive offers to join them for some stargazing. Erin knew what was coming - that this was Kevin’s last chance. It was a beautiful evening and the stars were like billions of fireflies, filling the dark sky. After what seemed like an eternity, Kevin finally mustered up the courage to propose. Martha was completely surprised! Of course she said “YES!” and they returned to the cabin to share the news with Kevin's family. While calling home to share the news with Martha’s family, they found out that they had coincidentally become engaged on Martha’s maternal grandparents' 50th wedding anniversary! That is certainly a sign of the many years they will share together. Kevin and Martha wish to sincerely thank you for visting their web site and taking the time to read up on them. Come back again.